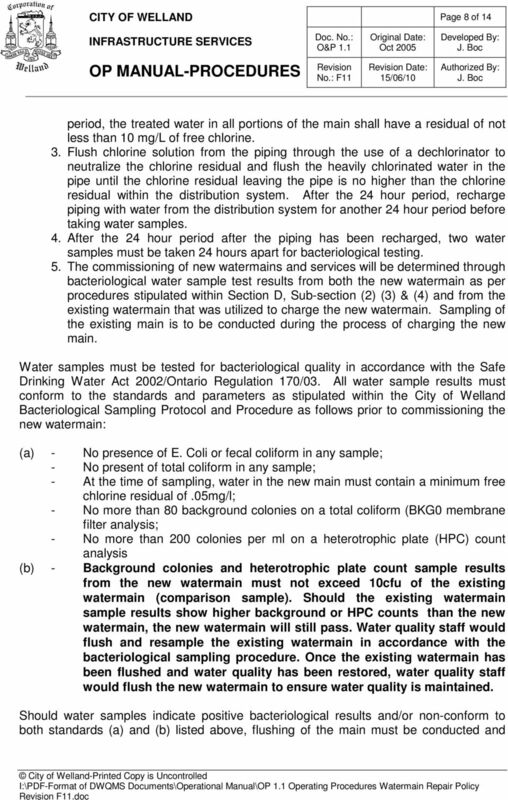 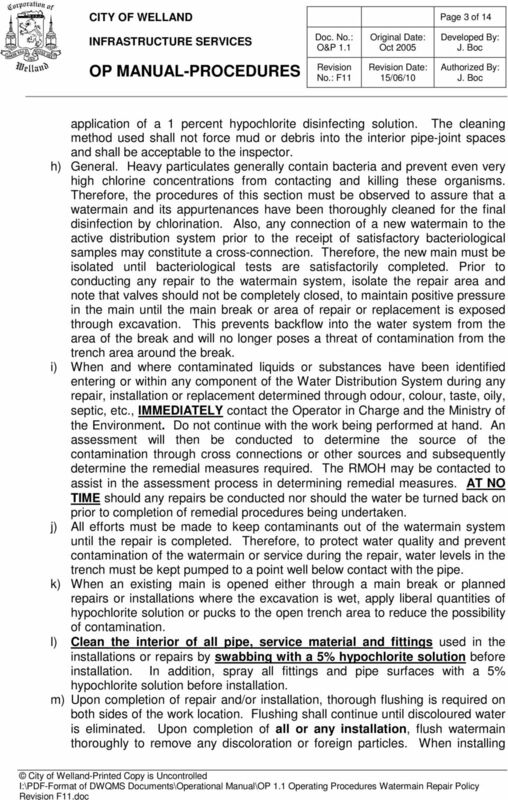 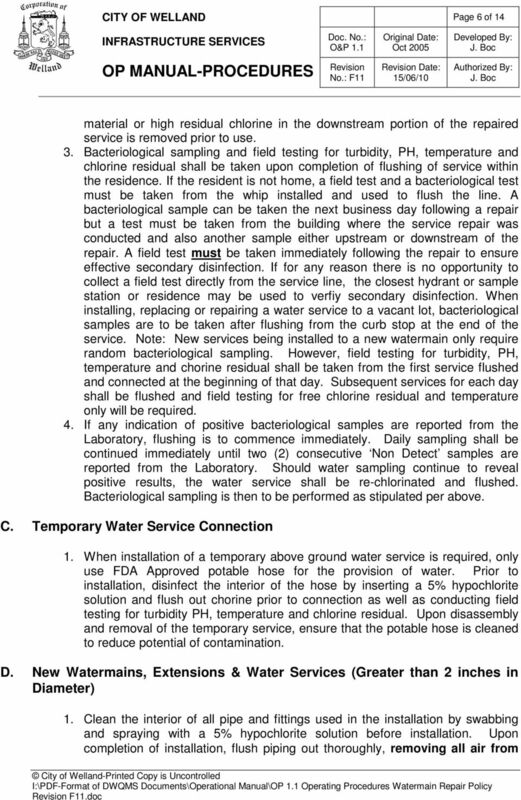 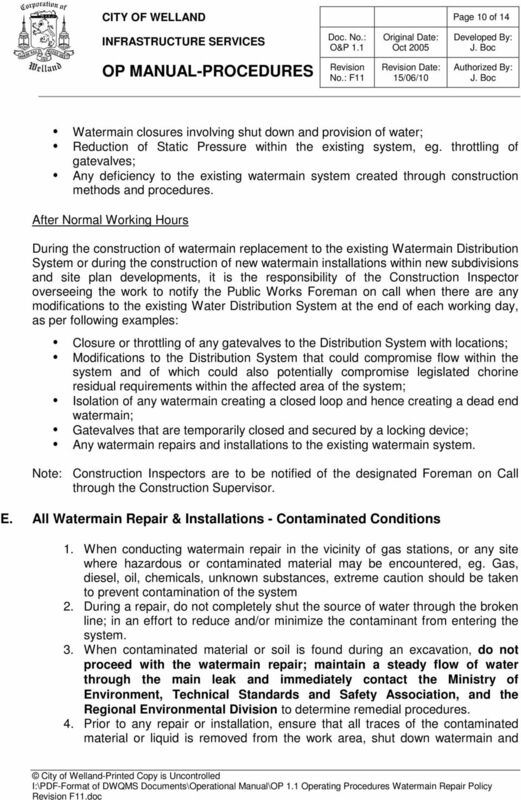 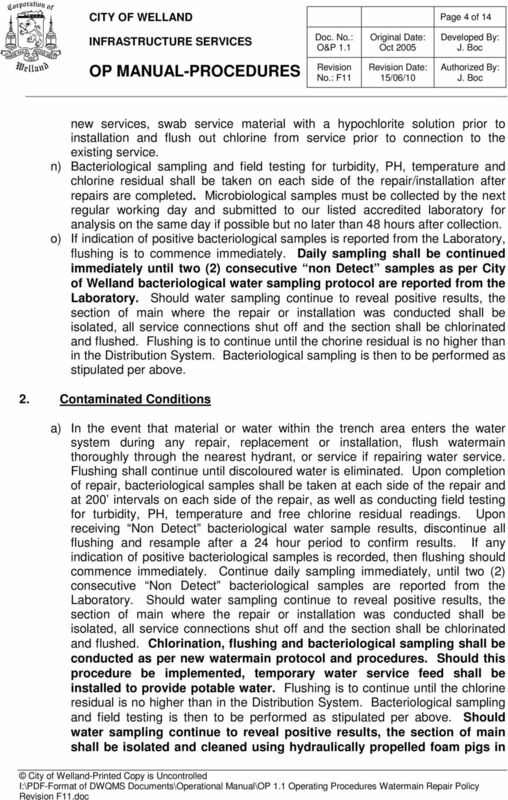 Download "STANDARD OPERATING PROCEDURES FOR ALL WATERMAIN DISTRIBUTION REPAIR & INSTALLATION"
1 Page 1 of 14 O&P 1.1 October 2005 J. Boc No. 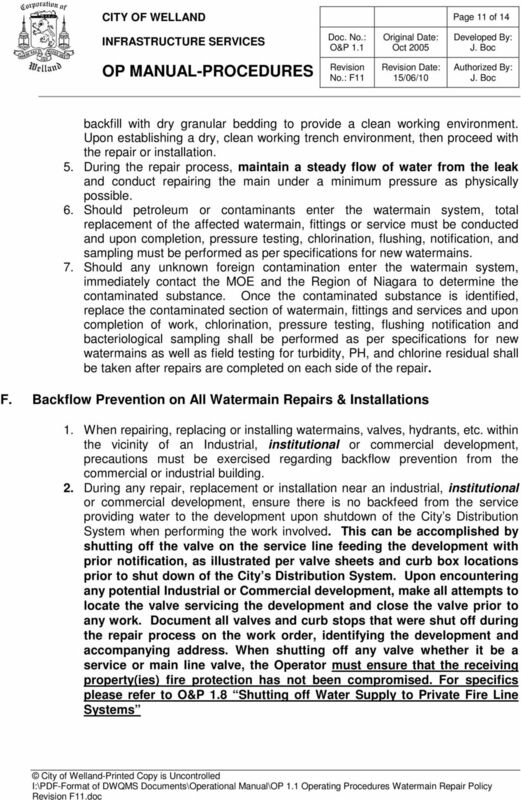 :F11 15/06/10 J. Boc STANDARD OPERATING PROCEDURES FOR ALL WATERMAIN DISTRIBUTION REPAIR & INSTALLATION 1.0 Purpose The purpose of this procedure is to ensure that all work being performed for watermain repair, replacement and installation conforms to provincial regulations as well as the City s requirements, so that the City of Welland continues to supply safe drinking water throughout its distribution system. 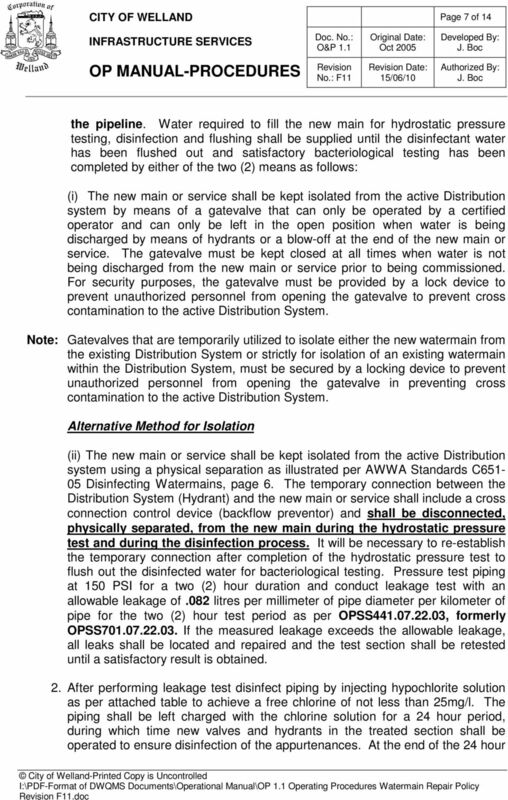 2.0 Application This procedure applies to all City certified water operators and/or contractors and anyone else who may conduct work on or that may impact the distribution system. 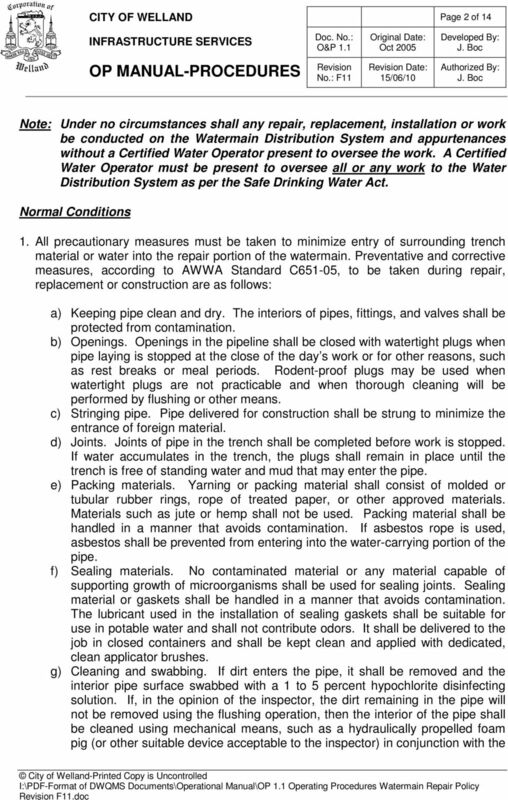 3.0 Definitions None 4.0 Associated Processes A. 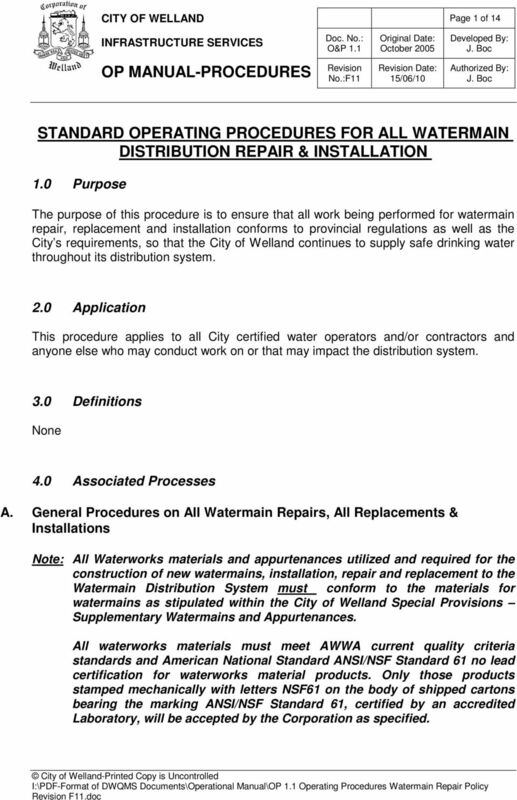 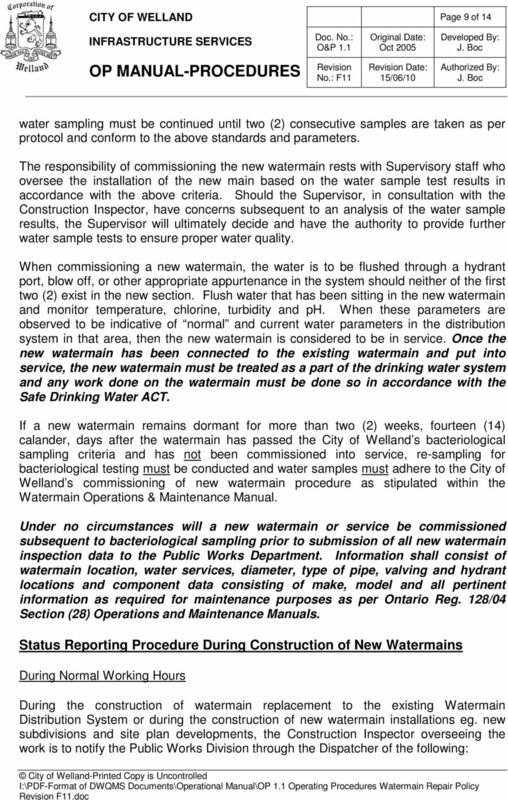 General Procedures on All Watermain Repairs, All Replacements & Installations Note: All Waterworks materials and appurtenances utilized and required for the construction of new watermains, installation, repair and replacement to the Watermain Distribution System must conform to the materials for watermains as stipulated within the City of Welland Special Provisions Supplementary Watermains and Appurtenances. 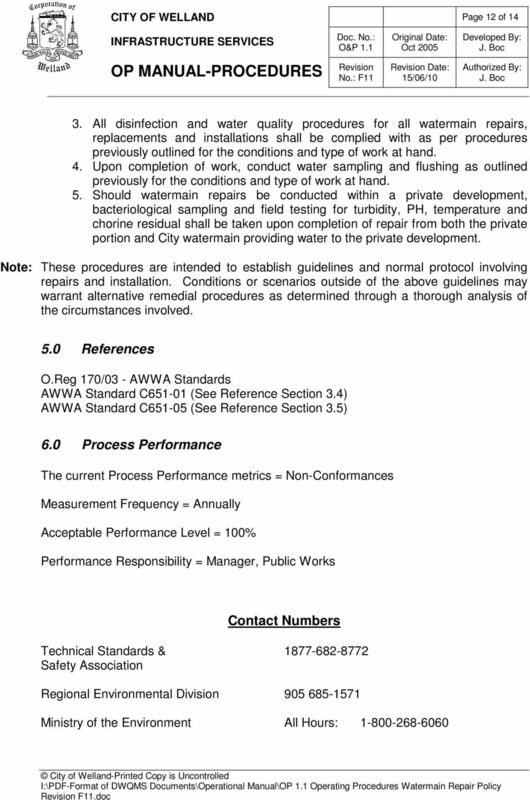 All waterworks materials must meet AWWA current quality criteria standards and American National Standard ANSI/NSF Standard 61 no lead certification for waterworks material products. 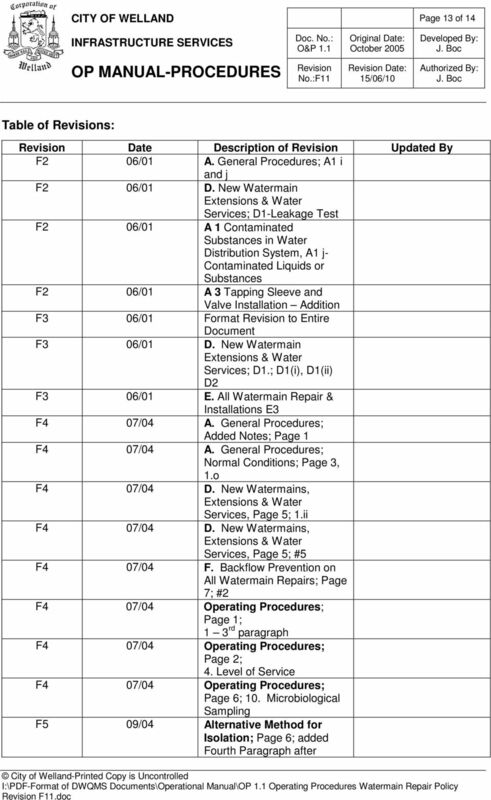 Only those products stamped mechanically with letters NSF61 on the body of shipped cartons bearing the marking ANSI/NSF Standard 61, certified by an accredited Laboratory, will be accepted by the Corporation as specified. 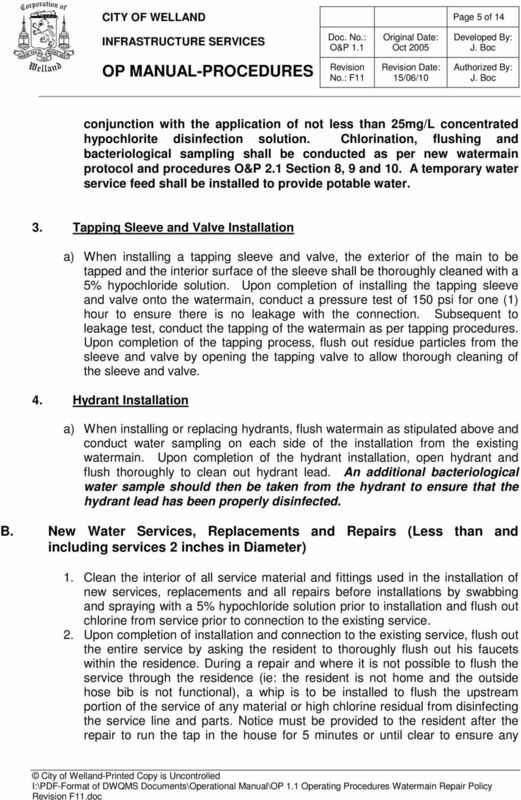 TAMPERS. 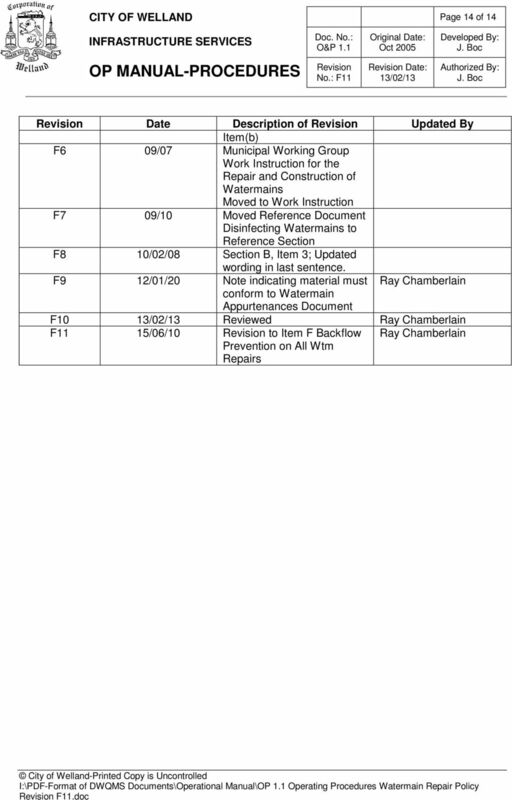 9949 Tabor Place, Santa Fe Springs, California, CA 90670, U.S.A.